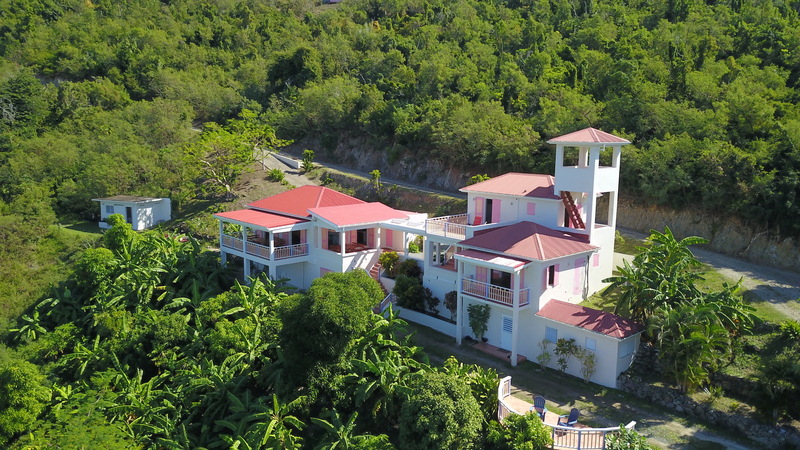 Plantation Villa was the first villa built by the owner at White Bay as his personal, private residence and continues to be his and many others' favorite. It acts as a home away from home to all its guests and their families. It is situated among numerous varieties of fruit trees, vegetables, and other indigenous plantings, and everything is at hand for guest consumption. Soon, high-tech solar panels will be installed on the roofs over its decks, making Plantation Villa is a first of its kind at reducing our environmental impact to the island. This private home is a sprawling tropical paradise that is perfect for families and groups. The open floor plan maximizes the trade breezes and features air conditioning in the bedrooms. Beach access is just down a private, landscaped path to White Bay. The Plantation Villa boasts a great room with a “Country Kitchen”, tile floors, and huge double doors that open to a large covered deck overlooking the iconic White Bay beach. The deck features a family size dining table, hammock, and plenty of room for outdoor enjoyment and breathtaking views. The kitchen is fully equipped with a microwave, stove/oven, excellent cutlery, blender, a breakfast island counter-top, spices, cutting boards, a coffee maker and french press, a full size fridge/freezer, and all dishes, flatware, and glassware. There is also a large BBQ outside and a second outdoor dining space. The great room features plenty of seating, a flat screen TV with Roku, stereo, telephone, internet, board games, ceiling fans, and hand painted murals from one of Caribbean's most famous artists. Located on the main level of Plantation Villa, the master suite has a king sized bed in a sprawling and large private space with a vaulted ceiling and romantic private patio. Located on the second floor, the Tower bedroom comes with a private bath and allows its guests to enjoy the extraordinary views of White Bay and privacy. It features a king bed and a spectacular sundeck with chaise lounges. It has ceiling fans, air-conditioning, and a private observation tower overlook with hammock. Tower access is by ladder steps to the top and is truly the piece-de-la-resistance! The guest bedroom is located down the passionflower-covered breezeway featuring a queen bed. It features views of White Bay with large open doors to let in the trade breeze, and has ceiling fans and air conditioning. Just off the kitchen is the “Bunk Room” with a pull-out king bed and a twin bed situated above it. It has a large smart TV making this room perfect for children or staff. This room is right next to the downstairs bathroom and shower. The separate 5th bedroom, also known as the Plantation Villa Apartment, features privacy and quiet in an open floor-plan with a queen-sized bed, ceiling fans, tile floors, air conditioning, and comfortable sitting area. There is a fully equipped kitchen, microwave, coffee maker, French press, blender, fine cutlery, cutting boards, spice rack, flatware, dishes, glassware, and all other comforts your kitchen at home. The bathroom has a large shower and vanity. In the living/dining area, there is a flat screen TV, Roku, telephone, internet, and breakfast counter. Just outside the entrance is a newly installed semi circular patio, with sitting area, bbq, and amazing views of sunsets in White Bay. "Plantation Villa is an absolute gem. We had visited White Bay by boat on a previous trip, but there’s something special about staying on the island, because life has a very easy pace on JVD. It makes Tortola seem like New York City lol. The villas themselves are amazing. Ours had a view I will never forget...and a hammock! It was equipped with everything we needed, and the staff were wonderful..."